Catherine Deneuve and Gerard Depardieu star in François Ozon's Potiche. With Potiche, filmmaker François Ozon (Hideaway) once again proves that he is in a league with Pedro Almodóvar (Broken Embraces) in terms of knowing how to cloak serious messages in the guise of beautifully crafted kitsch, and thereby dazzle the eye as well as engage the mind. Catherine Deneuve ((Park Benches) stars in the French film as a trophy wife (potiche) who takes over her husband’s factory (which makes umbrellas — a Deneuve in-joke) when he is stricken with a heart attack. She is highly efficient and liked by the workers and their unofficial spokesman, a local Communist politician (Gérard Depardieu, Inspector Bellamy). When her chauvinist husband recovers, though, it is only a matter of time before the two clash, and he tries to sabotage all the advances she has made. This film frequently harkens back to two previous movies by Ozon: his debut feature Sitcom, about a family slowly coming apart at the seams, and 8 Women, his pastel-colored musical set in the 1950s, which starred Denueve and a host of other A-list French actresses. Potiche takes place in 1977, and has the cultural signposts to prove it (including costar Judith Godrèche’s perfect Farrah Fawcett hairdo). As the film moves on, however, Ozon seems to be playing the 1970s against the 1950s. He veers between the melodramatic tone (and musical “cues”) of the Fifties, and the social consciousness and bright disco hues of the Seventies. The result is a hearty comic stew that makes sexual politics seem very “comfortable,” in the manner of a soap or a sitcom. Viewers who are very familiar with the two leads — who have starred together in six previous films, including Truffaut’s The Last Metro — will have to overcome their initial surprise at their current appearance. 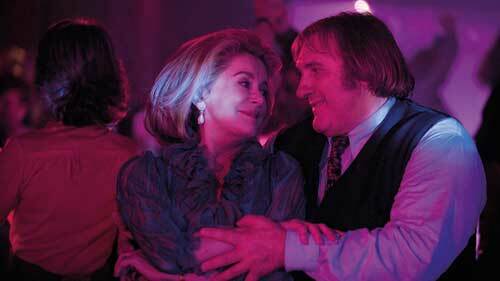 Deneuve has apparently undergone plastic surgery, and Depardieu has become an even (ahem) bigger, superb actor. Once those differences are absorbed, one can concentrate on the beautiful ease with which the two interact. This Music Box release combines the movie with a lengthy making-of documentary comprised mostly of behind-the-scenes footage and a specially made trailer and costume tests. One wishes that the stark white subtitles didn’t appear so often on white surfaces, but that is a small matter. 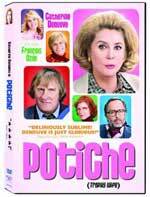 Potiche is a comic delight that will no doubt acquire a cult following on disc.